Product prices and availability are accurate as of 2019-04-09 18:54:21 EDT and are subject to change. Any price and availability information displayed on http://www.amazon.com/ at the time of purchase will apply to the purchase of this product. GENUINE CANON INK: Set of 5 ink tanks includes: 1 Large Black: PGI-220BK, 1 Cyan: CLI-221C, 1 Magenta: CLI-221M, 1 Yellow: CLI-221Y, 1 Black: CLI-221BK. In order to maximize the superb printing ability of the "FINE" print head, Canon continues to develop ink and paper specifically for PIXMA printers to enhance their performance. In 2005, ChromaLife100, a system that improves the beauty and permanence of printed images, with the combination of genuine Canon dye inks, FINE print head, and photo paper, was developed. 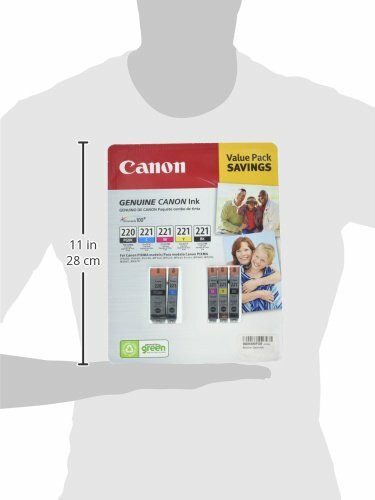 Then in 2008, a further advance has been achieved with the introduction of new genuine Canon dye inks and photo paper. The new system, ChromaLife100(plus), provides longer-lasting and more beautiful vivid photo prints. 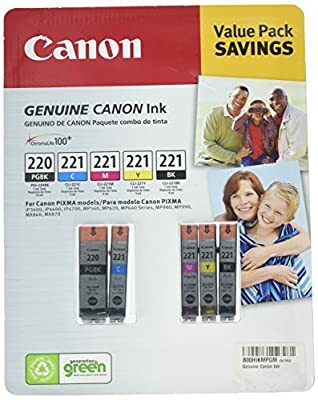 GENUINE CANON INK: Set of 5 ink tanks includes: 1 Large Black: PGI-220BK, 1 Cyan: CLI-221C, 1 Magenta: CLI-221M, 1 Yellow: CLI-221Y, 1 Black: CLI-221BK. COMPATIBILITY: PIXMA iP3600, iP4600, iP4700, MP560, MP620, MP640 Series, MP980, MP990, MX860, MX870. REDUCE WASTE AND LOWER COST: by only replacing the color that runs out. PGI-220BK INK TANK: This Pigment Black Ink Tank produces professional document quality with crisp, smudge-resistant text. Designed with FINE (Full Photolithographic Inkjet Nozzle Engineering) technology, prints realize added sharpness, detail and quality. Plus, when printing with genuine Canon inks and photo papers the ChromaLife100(plus) system gives you beautiful, long-lasting photos. CLI COLOR SERIES: Ink delivers improved color, a wider color gamut and better color fastness. Print only with genuine Canon ink and photo paper to achieve optimum results through the ChromaLife100(plus) System which will deliver stunning results and longevity.